Are you interested in getting the latest and greatest news concerning triathlon from the research world? Do you wish to stay on top of the latest thoughts from some of the brightest minds in the sport to gain an edge in your next race? Then you’ll love our research roundup series of blog posts, which is a regular summary of the best, most relevant and most interesting brand new research in triathlon, its three disciplines, nutrition, and all other things related to triathlon. We wouldn’t call be Scientific Triathlon if we didn’t do something like this, right? For each study in the round-up, I’ll give a short summary of the main results and conclusions as well as my own interpretation and conclusions. Of course, I’ll link to the original sources of all studies, so if you’re a science-fan you can have a look yourself. Enjoy! In this study from the University of Verona, 29 runners were divided into three groups for an eight-week intervention; a low intensity group, a high intensity group, and a high intensity group with additional high-weight low-rep strength training (leg press with eccentric and concentric contraction). Running economy did not improve statistically significantly in the former two groups, but did improve in the strength training group (p < 0.05). This is a small study, but taken together with several other studies with similar results, there is at least a trend that suggests there is something to it. I’m including this one more for the fact that somebody actually took the time to scientifically prove this fact, which is pretty obvious to anyone who’s ever swum in these kinds of temperature. The temperature measured was the core temperature, and its decrease rate was quite significant in the skin-suit group at -8.3°F/-4.6 °C per hour. There was a continued linear temperature drop for the early parts of the bike (11 minutes), so with that in mid you would expect that swimming without a wetsuit in these kinds of temperature would impact performance significantly. However, actually proving this was left for later studies. In this study from the Santa Catarina State University in Brazil, 21 cyclists were divided into two training groups where one did intervals at just above functional threshold power for four weeks, and the other did even higher intensity intervals approaching VO2max. They found that the latter group had larger improvements in both VO2max and lactate threshold (6.3% vs 3.3% p = 0.034, and 54.8 vs 27.9 % p = 0.023). This is not a surprising finding. Plenty of similar studies have had similar results. With this kind of studies, it’s important to understand that it’s not sustainable to train consistently for longer periods on programs like this. In other words, the validity of studies comparing different training methods are usually limited by the study duration, which is rarely greater than 2 months. So when it comes to applying scientific findings to your own training, make sure you take this into consideration. In this interesting and well-designed study, 52 men were divided into five groups; endurance training followed by strength training in the morning (mES), strength followed by endurance in the morning (mSE) and corresponding evening groups (eES and eSE) plus a control group which continued training like they were used to. The study duration was 24 weeks, and primary outcomes were VO2max and maximal power in a graded cycling test and maximal strength in dynamic leg press. The researchers found that the endurance parameters improved significantly more when the endurance sessions were done before the strength sessions, which is in line with current knowledge. There was no difference in the strength outcome depending on session order, and no difference in endurance or strength outcomes depending on the time of day of sessions. In this small Brazilian study enrolling 12 subjects, four different pre-exercise meals were compared; a high-GI breakfast (such as banana, white bread), a low-GI breakfast (apple, whole-wheat bread), fasting with only sports drink consumption, and fasting with water consumption. Each subject tested all protocols. The meals were consumed 30 minutes before a low-intensity bike workout, and blood glucose levels were measured at several points before, during and after the workout. 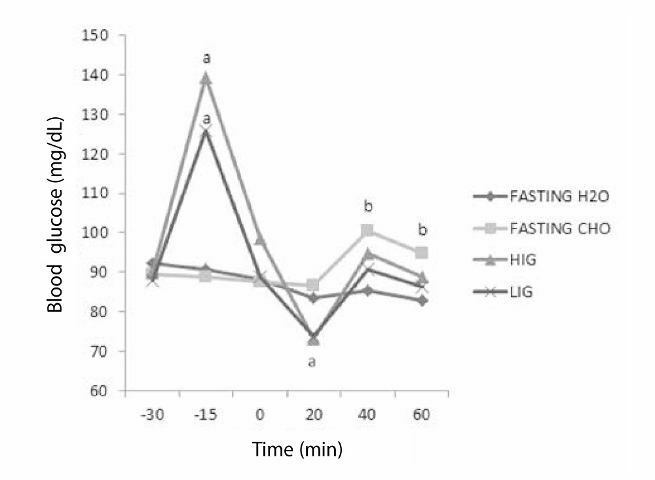 The results showed no significant difference between low-GI and high-GI meals (unlike the majority of similar studies), but they did show that the meal protocols resulted in lower blood glucose levels 20 minutes into the exercise. The reason for this is that having meals increases absorption of blood glucose by muscle fibers (this is called glycemic response), which the muscles then use as energy. However, if blood glucose drops too much or too rapidly, there is a risk of hypoglycaemia which can vary in severity, but generally speaking makes exercising very unpleasant. Blood glucose level as a function of time in the four groups. Time starts at -30 minutes with a meal (or not), and the workout starts at 0 minutes. Figure from original article. The researchers found fasting with sports drink to result in a relatively even glycemic response, but with higher (better) levels of blood glucose than fasting with water. I don’t think that these results by themselves are convincing, since the study is so small. That said, the majority of studies on the same subject would agree that before morning workouts of low to moderate intensity fasting and consuming water or sports drink is sufficient. It would be interesting to see if larger studies can repeat the non-significant difference between low- and high GI pre-workout meals. This systematic review including 56 studies is in my opinion one of the most interesting and relevant studies in this research roundup edition. It investigated how objective measures from during exercise (oxygen consumption, heart rate) and at rest (blood markers, heart rate) compared to subjective measures (mood, perceived stress) in terms of correspondence to acute and chronic training load. They found that the objective and subjective measures did not correlate, and that the subjective measures more accurately corresponded to the acute and chronic training loads. This is something to really pay attention to. No matter what your HRV-app or fancy GPS-watch algorithm says about your recovery or wellbeing, the ultimate determinant should still be how you feel, and not what the numbers tell you. That’s it for this time. Don’t hesitate to ask for clarifications in the comments below, or shoot me an e-mail. Also, if you know of any interesting brand new research that you think should make the list in future editions, please let me know about it. Thank you for reading!